We love trails... and it shows. Trail Heads is a volunteer-based organization with a mission to create infrastructure and support programs for quality trails throughout southwest Indiana. Trail Heads has partnered with Cycling Solutions Bicycle Shop to create a repair and distribution program for surplus bicycles and gear. Click the link to the right to learn more about our new Free Rider Program. Over 8,000 youth participants have attended our Booster Clubs! Since 2010, the Boonville Bike Club has proven after-school bike clubs are the best way to get more kids on trails. After eight years of seeing the benefits for students in Boonville we have a new, expanded vision to help other schools. Booster Clubs are what we call each chapter and we would love to help form one in your community. The Boonville Bike Club provides after-school, weekend, and summer activities for all students in Boonville. Activities include IIMTBA racing, group rides, skills training, bike maintenance, trail maintenance, and community safety events. For 2019, we plan to offer a 6-week program in the spring and 10-week program in the fall that will feature weekly skills sessions, group rides, and weekend racing in the IIMTBA. Coach Ben Moll (Cycling Solutions Bicycle Shop) and Nicolas Costeur (CHS) offered the first season of Castle Bike Club in 2018. 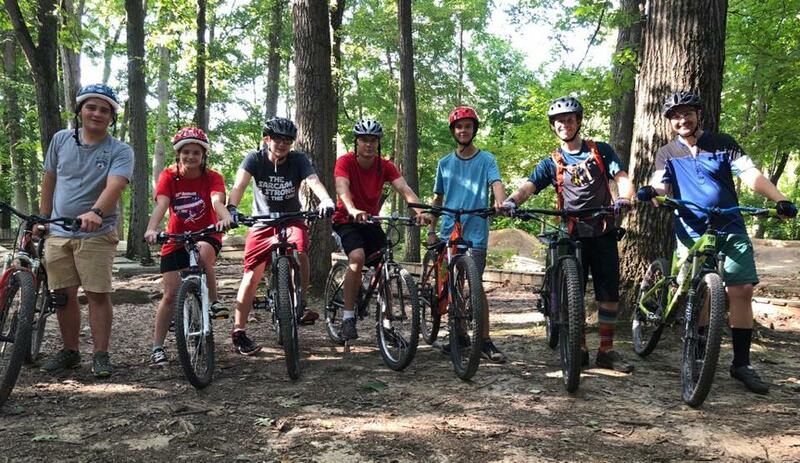 The club participated in a 10-week program featuring skills sessions and group rides at Scales Lake Park. For 2019, we plan to offer a 6-week program in the spring and 10-week program in the fall that will feature weekly skills sessions, group rides, and weekend racing in the IIMTBA. 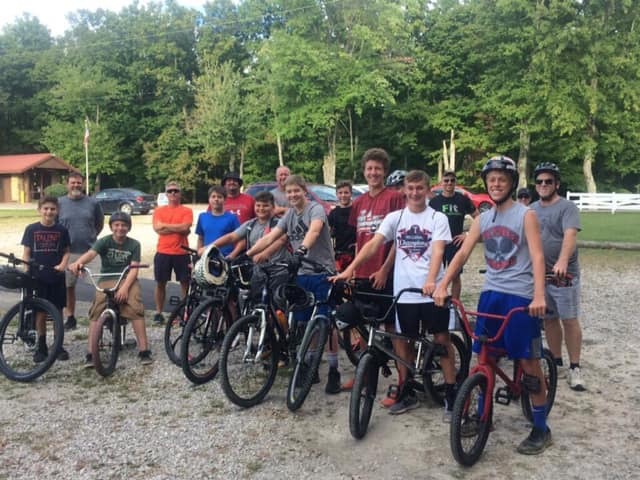 Coach Rick Stinson offered the first season of Tecumseh Bike Club in 2018. The club met for several group rides at Scales Lake Park and we plan to boost this program in 2019. We plan to offer a 6-week program in the spring and 10-week program in the fall that will feature weekly skills sessions and weekend racing in the IIMTBA. Contact us to see how we can work together to help your community. Quality trails increase quality of life. Trail Heads uses our experience with trail stewardship and after-school bike programs to build the School-to-Trail Initiative. The goal of this initiative is for students in every school to have safe and easy access to trails or bike parks. To meet this goal, we are helping other schools form after-school programs while advocating for local bike-parks and safe routes to community trails through on and off-road trail systems. Let us know how we can help your community. The Boonville Bike Club has served as a trail steward for the park since 2011. We have helped maintain the park's 6.75-mile loop, over a mile of which we have designed and helped construct. We also designed and constructed the first phase of The Pit MTB Skills Area featuring dirt jumps, beginner pump track, and challenge course. Phase two of The Pit will feature an advanced pump track, slopestyle trails, dual slalom course, and 2.25-mile beginner trail. Completion of phase two is expected Fall 2018. In 2012, the Boonville Bike Club teamed up with students at BMS to design and construct a 1-mile singletrack loop on campus. Some of the trail runs through open field while the rest is tucked away in Panther Woods. The trail was student-built and continues to help us teach trail maintenance. Trail Heads has highly qualified volunteers ready to help your community develop a trails master plan. We focus on quality trails that strategically link schools and neighborhoods to trails and other features.